Crystal database; fractography; sputtering standard. The University of California at San Diego and Lawrence Berkeley National Laboratory have created an open-source database of elemental crystal surfaces and shapes. The database, called Crystalium, is a new and expanding set of information about various crystals. The database can help researchers design new materials for various applications, such as batteries, catalytic converters, fuel cells, semiconductors and others. Crystalium provides data on surface energies and equilibrium crystal shapes of more than 100 polymorphs of 72 elements in the periodic table. In simple terms, surface energy quantifies the disruption of intermolecular bonds. This occurs when a surface is created. Surface energy also describes different facets of a crystal. It enables the understanding of surface segregation, roughening, catalytic activity and shape. Researchers used automated workflows to calculate the surface energies of various crystals. “This work is an important starting point for studying the material surfaces and interfaces, where many novel properties can be found. We’ve developed a new resource that can be used to better understand surface science and find better materials for surface-driven technologies,” said Shyue Ping Ong, a nanoengineering professor at UC San Diego, on the university’s Web site. “As we continue to build this database, we hope that the research community will see it as a useful resource for the rational design of target surface or interfacial properties,” Ong said. The National Institute of Standards and Technology (NIST) released a new, expanded guide on fractography, a tool that helps with the analysis of fractured glass and ceramics. 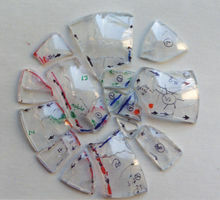 Fractography provides clues on why these materials can fail and how to make them more durable. It also provides information about the loading conditions of this technology. To examine materials, fractographers use a binocular stereoptical microscope and a scanning electron microscope. NIST released the first guide in 2007. It was used to analyze the patterns in fractures of ceramics and glasses used for building materials, medical devices, implants and others. The goal of the new guide is to make fractographic analysis less of an art and more an engineering practice. The guide also emphasizes practical approaches for failure analyses. It covers equipment with updates on new microscopy techniques. “Although thousands of ceramic or glass items and test specimens are broken daily, only a tiny fraction is examined fractographically. A wealth of information is lost about the causes of fracture and the nature of the material,” Quinn said. Quinn, who formerly worked at NIST, is the author of both the original and expanded editions of the guide. Since retiring from NIST in 2009, Quinn has continued to serve the organization as a research associate. ASTM International has devised a new standard on the baseline quality, reliability, and process for manufacturers of sputtering targets. Sputtering is basically a physical vapor deposition (PVD) process. PVD involves ejecting a material from a target. The material, in turn, is deposited on a substrate. Regulatory bodies will be able to use the standard as a reference point. This, in turn, can be used in product qualification, according to ASTM International, one of the world’s largest voluntary standards developing organizations. Direct-write liquid litho; fishy DSA nanowires.